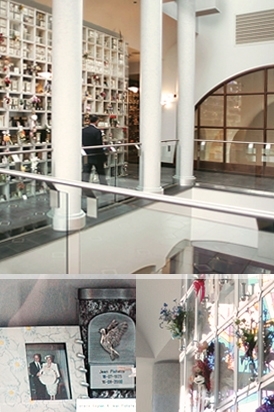 A columbarium is a grouping of funeral niches set side by side, like a dovecote. Urns containing the ashes of the deceased are placed there. At the Saint Martin mausoleum, the niches are of a very pure design in marble and glass, and a large selection of urns is available. You may choose between individual and family niches or a common vault. A niche is a vital and personal space to memorialize your loved one. You may leave photos, thoughts, or small objects, as you please. The inscription and inurnment are included in the purchase price. There is never any cost to open the niche.